Nursery Rugs Add Decor, Safety and Comfort to Your Nursery Room. Get Cool Baby Room Rug Info Here. 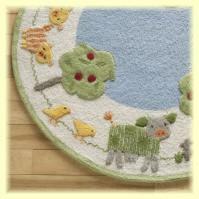 Nursery area rugs are a great way to decorate your baby nursery. A well chosen area rug can tone down a theme, add a splash of color, or be instrumental in pulling the individual elements of your nursery design together. But first take a look at some of our favorite baby room rugs... at our Nursery Room Rugs Store. If You Have Nursery Carpet. If You Have Hard Nursery Floors. From A Nursery Decor Point Of View. Other Benefits Of Nursery Room Rugs. Although nursery carpet has traditionally been a popular floor covering for the baby nursery, research is showing that it may not be the best for your baby. Most carpets are manufactured using hazardous chemical substances. Somewhat like a sponge, carpet absorbs toxins and allergens from the air, as well as, any substances, such as carpet detergents, that come into contact with it. Pollutants from the hazardous chemicals, and the absorbed toxins and allergens, are then off-gassed back into the air of your home. In addition, carpet gathers dust which results in a breeding ground for dust mites. So nursery carpet is not the best flooring choice for you baby nursery, particularly if it is synthetic. However, most of us don't have the budget to just go around ripping up nursery carpets, especially if we want the rest of the home done in new flooring to match. If your nursery carpet is old and worn, throw a beautiful, soft nursery area rug over it - no one will ever know. If your carpet is fairly new, a nursery rug can extend the life of your carpet as it gets less tread wear and will not get stained by baby messes. absorb most of the dust in the room, preventing it from reaching the carpet. absorb baby spills - read spilt milk, spit-up, poo and wee! Bung the baby room rug in the wash every two weeks or so and you will have beautiful, clean and relatively safe nursery flooring! Read more about cleaning your nursery area rug here. If you have hard nursery flooring, such as natural wood, laminate or bamboo, you won't need to spend as much energy worrying about harmful toxins affecting your baby. A nursery room rug provides a warm, soft place to land. Heaven forbid that your baby should ever fall from a height in the baby nursery. If you follow these baby crib safety guidelines and these baby furniture safety tips, there shouldn't be any high falls. However, accidents do happen - it's better to be safe than sorry. By making sure that the landing zone is padded you can minimize the risk of serious injury. Serious injury aside, however, your baby will, tumble, bumble and generally fall all over his own feet, from the time he takes that first hesitant step into the walking world. For some reason, babies have an awful tendency to land smack on their noses when they fall. A little tumble on a hard floor can really hurt! A baby room rug gives a much softer landing. A rug is soft and warm for rolling around on. Don't let a cold, hard surface get in the way of all the fun you can have rolling around on the floor with your baby. They love to be tickled, zerbeted (my word for blowing raspberries on their lovely warm tummies), and generally rough and tumbled. Make the most of it. A rug is not slippery. Along the same lines, a slippery floor is an accident waiting to happen when baby is taking those first tottering steps. 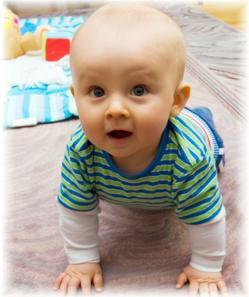 Nursery room rugs can reduce the risk of your adventurous munchkin slipping and banging his head. Make sure the rug has a non-slip backing or use a rubber rug pad, and keep rug corners away from pathways (in front of doors for instance) to prevent tripping. A baby room rug is soft and warm for crawling around on. I know it seems a long way off, but that little life growing inside you will be crawling around like a dynamo in no time. If you have a winter baby, she will probably be going through this most exciting stage in summer, without the benefit of warm thick leg coverings. Those bare knees can really take strain on a hard floor. An important one for mom. Hard floors result in loud footsteps and even echoing noise depending on the size of the home and the furnishings. The last thing you want is to spend an hour sending baby off to dreamland, only to wake her up two minutes later with your clunky footsteps. Babies are very sensitive to loud noises, and are easily startled. You do not want your baby associating her baby nursery, where she should be secure and comforted, with loud, startling noise. On the practical side, nursery area rugs will protect your flooring from wear and damage. If your flooring is old, rugs can hide any unsightly marks and gouges. This is the most obvious benefit of using a rug in your baby nursery. The decor in your baby nursery is limited only by your imagination. The hard and fast interior design rules don't apply here. Nursery room rugs come in all sorts of different shapes and sizes with patterns and pictures to match any imaginable theme. 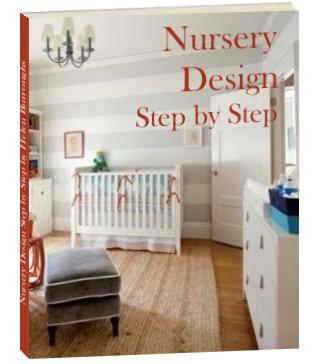 Add a rug in one of your baby nursery accent colors to tie the overall scheme together. If you have a large baby nursery, you may want to divide it into various sections, separating a changing and play area from a sleeping and feeding area, for instance. A couple of well chosen nursery area rugs are a great way to do this. Nursery rocking chairs are notorious for pinching little fingers and toes under the runners. It is best to place your rocking chair on nice thick nursery carpet or a rug with a rug pad. This will minimize the injury to fingers if they do get rocked on. Nursery rugs under rockers also keep the rocking movement quiet while baby drifts off to dreamland. Nursery rugs deliver a great deal of benefit, for a relatively low price tag. Click here for advice on selecting the right nursery area rugs for you.